My friends say I am living the dream, working part time as a freelance writer and playing the rest of the time in San Francisco, my adopted city. I am. But the landscape in this particular dream has shifted over the years, making my professional future more uncertain than ever. Most employers on Craigslist now want “content providers” instead of writers, and those content providers must be savvy about social media and often be willing to handle some office chores as well. Some publications that once paid decent rates now offer freelancers the opportunity to “build a resume” instead of paying them. Some writers, desperate to do just that, agree to write for free because competition is so stiff. Of course, working for free hurts all of us. Think about it. In the last decade, every daily newspaper in the country has sacked or bought out up to two-thirds of their staff, plunging a lot of highly skilled, deadline-abiding people into the freelance pool. Small ad agencies and p.r. firms have closed or been devoured by larger ones. Yet colleges and universities continue to hand out degrees in journalism, communications and media studies. Fifty years ago, I sold my first magazine article to a national teen publication. Because I thought those magazines were written by teens, not grown-ups, I submitted a feature on a boy at my high school, a gifted comic artist. The magazine sent me a check for $25, which I never cashed. Twenty-five years ago, I wrote my first book, a whale-watchers guide for Globe Pequot Press. At the time, I worked as a newspaper reporter, and an ambitious agent tracked me down after reading some of my syndicated travel stories. She talked me into writing that book, and now 16 titles – all nonfiction, on a variety of topics -- bear my name. Ten years ago, I took a buyout from a daily newspaper after more than two decades there. Thanks to a small pension, a lot of hustle and now, Social Security, I am a full-time freelance writer, at least part of the time. Just a month ago, in three days I interviewed five people and finished six articles for the web sites, marketing firms and newspapers that buy my work. Why am I doing math to help explain my life as a writer? 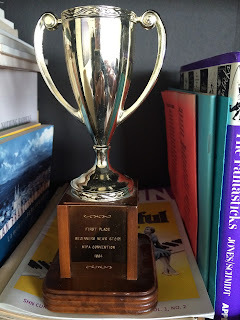 A few days ago, a friend noticed a small trophy on my bookshelf. The plaque reads, “First Place” and indicates I won it for a “beginners news story" in 1964 at a Missouri Interscholastic Press Association Conference in St. Louis. After talking abut the trophy with my friend, I realized that ironically, by the time I won it, I was no longer a beginner. The first paper I worked for was The Plymouth Rock, in 1962 at my junior high school. (I am still friends with my teacher and my first editor.) Then I branched out to write for and edit The Peppermint Press, the Candy Stripers’ newspaper at a local hospital where I volunteered. After I won that trophy but before I left high school, I wrote regularly for the teen page at a daily paper in St. Louis, a weekly suburban paper, a St. Louis Press Club publication, a local teen magazine and my high school paper. Once I got a taste of the writing life, knew the thrill of a byline, I wanted more. I got it. After putting in time at an ad agency, a hospital’s public relations department, a religious book publisher and a federally funded educational laboratory, I spent 23 years at the St. Louis Post-Dispatch. There, I worked as a feature writer, news reporter, health writer, theater critic, lifestyle columnist, travel writer, restaurant critic, food writer and night city editor. At the paper, I predicted that the FDA would ban silicone breast implants. I also helped spread the word about endangered pandas and I spent many an afternoon interviewing Broadway stars. Along with my colleagues, I worked seven days a week covering the Great Flood of 1993. (I was interviewed on CNN about that.) I also wrote about pothole repairs, the birth of the zoo’s first baby elephant and recipes for apple pie. By 1990, when I wrote my first book, that prediction seemed more likely than ever, so I started freelancing in case I needed a back-up plan for my career. Over the years, I’ve written articles for Ms., Southwest Airlines, the San Francisco Theological Seminary, Family Fun, Northwest Parks and Wildlife, the Catholic Hospital Association, Toastmasters International, Cruise Travel and numerous grocery magazines. My stories have been published in newspapers across the country, including USA Today. Writing skills are transferable, so I also have penned web copy, brochures, releases, newsletters, direct mail pieces, speeches and one play. Clients have included a massage therapist, a theater company, a retail shop, an acupuncturist, book authors, a marine conservation organization, a dermatologist, several marketing firms and the lovely town of Gustavus, Alaska. When people ask, I say I am a production potter, willing to make whatever sort of paragraphs that publishers want. My best sellers include “Chemotherapy and Radiation for Dummies” (Wiley) and “Dolphins for Kids” (NorthWord Press). With Eve Batey, I wrote "100 Things to Do in San Francisco Before You Die." Other titles include books about cougars, waterfalls of the world, manatees, the St. Louis Zoo, sharks, the St. Louis Science Center and beavers. One book is a collection of my favorite columns from the newspaper. Today, I am proud to be a contributing writer for Next Avenue (nextavenue.org), the web site for people 50 and older. I also write regularly for jWeekly in San Francisco and the St. Louis Jewish Light. My former newspaper buys two or three travel stories a year from me. From time to time, I put together calendar copy for a firm in Detroit and I do business with a marketing company in Tucson. So what's my secret to succeeding in freelance? That's simple. Most often, I say “yes” to work queries that show up in my email because “yes” means work and work means money to pay the rent. Work also means a great deal of satisfaction that I still do the work – and care deeply about it -- that chose me when I was 14 years old, back in junior high. I am living the dream. But keep those emails coming!